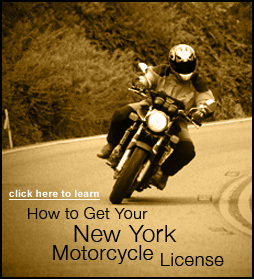 The MSF Basic RiderCourse 2- LW qualifies as a NY DMV License Waiver course in New York! This course is an 8-hour course that contains a unique on-line classroom segment as a pre-requisite and also offers a variety of practice riding exercises designed to further develop your riding skills on your own motorcycle. The riding exercises conclude with a skills test. In order for a participant to earn their NYSMSP BRC2-LW License Waiver Completion Card they must successfully complete the eCourse (on-line) and the skills evaluation on the range. It is designed for individuals that have had some street riding experience and have held a valid New York State Motorcycle Permit for at least 1 calendar year, and possess some street riding skills. You'll practice these critical riding skills on your own motorcycle in our secure riding setting. Successful completion of a BRC2-LW qualifies you for a motorcycle license road test-waiver with the New York State DMV. Skip the trip to DMV and sign up today for a NYSMSP BRC2-LW, your fast track to getting your Motorcycle License! Bring your own (or borrow) a motorcycle/scooter and use it for the BRC2 riding range exercises. Possess a valid New York State Driver License (Junior Operator license holders do NOT qualify for a road test waiver and may not enroll in this class). Possess a valid NY motorcycle permit. Pass a BRC2-LW Course Knowledge Test (On-line). Pass a BRC2-LW Skill Evaluation, which is administered after all the BRC2 riding range exercises have been completed. A motorcycle (must have a valid NYS DMV Safety Inspection Certificate affixed). Your valid NYS Driver License. Your valid NYS Motorcycle Permit. A valid NYS motorcycle’s registration. A valid motorcycle’s insurance card (FS-20/ FS-21). A Helmet- DOT-approved motorcycle helmet (you may borrow one if needed). Eye protection (face shield or goggles). Over the ankle footwear (one inch above the ankle). Rain gear, classes run- rain or shine.